For more than 30 years, San Francisco's Kronos Quartet - David Harrington, John Sherba (violins), Hank Dutt (viola) and Jeffrey Zeigler (cello) - has pursued a singular artistic vision, combining a spirit of fearless exploration with a commitment to expanding the range and context of the string quartet. In the process, Kronos has become one of the most celebrated and influential ensembles of our time, performing thousands of concerts worldwide, releasing more than 45 recordings of extraordinary breadth and creativity, collaborating with many of the world's most eclectic composers and performers, and commissioning more than 700 new works and arrangements for string quartet. Kronos' work has also garnered numerous awards, including a GRAMMY for Best Chamber Music Performance (2004) and "Musicians of the Year" (2003) from Musical America. Since 1973, Kronos has built a compellingly eclectic repertoire for string quartet, performing and recording works by 20th-century masters (Bartók, Shostakovich, Webern), contemporary composers (Aleksandra Vrebalov, John Adams, Alfred Schnittke), jazz legends (Ornette Coleman, Charles Mingus, Thelonious Monk), and artists from even farther afield (rock guitar legend Jimi Hendrix, Azeri vocalist Alim Qasimov, avant-garde saxophonist John Zorn). Integral to Kronos' work is a series of long-running, in-depth collaborations with many of the world's foremost composers. A non-profit organization, the Kronos Quartet/Kronos Performing Arts Association is committed to mentoring emerging musicians and composers, and to creating, performing, and recording new works. 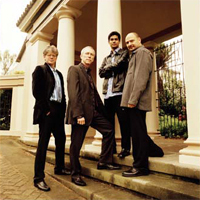 The quartet spends five months of each year on tour, appearing in concert halls, clubs, and festivals around the world including BAM Next Wave Festival, Carnegie Hall, the Barbican in London, WOMAD, UCLA's Royce Hall, Amsterdam's Concertgebouw, Shanghai Concert Hall and the Sydney Opera House. Kronos is equally prolific and wide-ranging on disc.